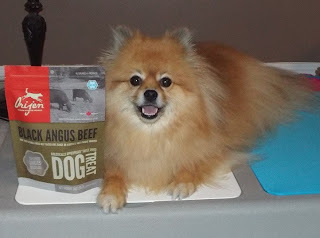 My pals at Chewy.com know I love beef! They sent a package of Orijen Black Angus Beef Singles Freeze-Dried Dog Treats for me to bark about. They must know how much enjoy barking! BOL!! 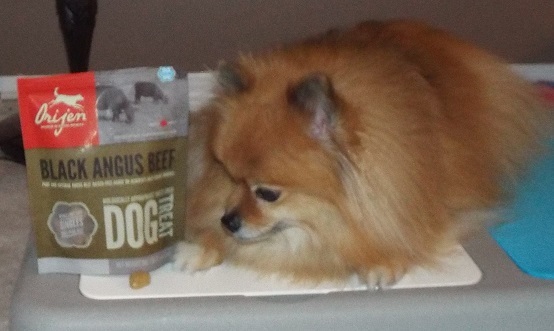 The treats do not really cause barking, unless you are the type of dog who barks when you want a treat. BOL! Although... most of us enjoy barking when we get a delivery...so... We get to bark at least one time - when our order from Chewy.com is delivered! High Paw! I see a treat. I want it! "Leave it" and "wait" are not my favorite "tricks". I smell yummy beef! I'm going to grab it as soon as Mom says "OK". Hurry up Mom! 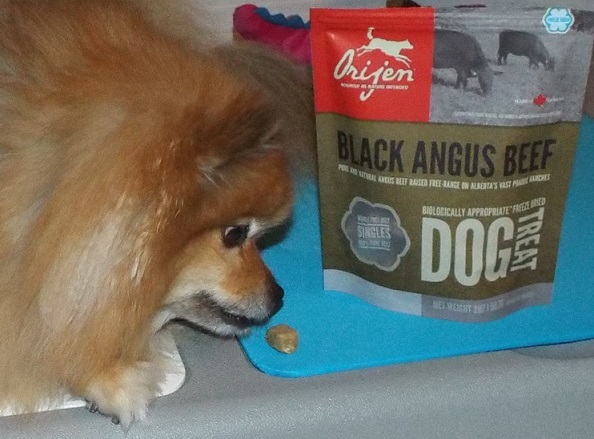 The Black Angus cattle for Orijen Black Angus Beef treats are pasture-raised in Canada. The treats are all natural. There are no preservatives or grains in them. They are pawfect for dogs on limited ingredient diets. Instead of cooking, Orijen uses flash freezing to maintain maximum nutritional value. Yummy!! It took 3 treats to get this photo, BOL!! I kept swallowing the treats before the camera could take the picture. It's a good thing there are less than 7 calories per treat! 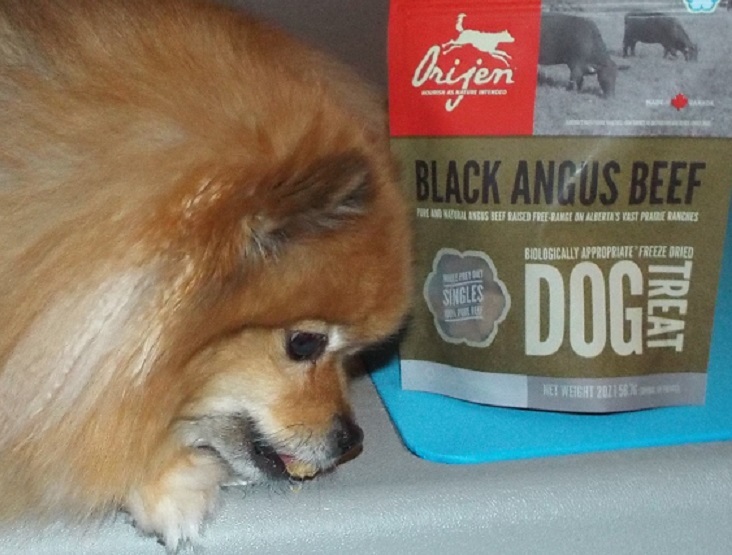 Orijen Black Angus Beef Singles freeze-dried treats are healthy and delicious! High Paw! Thank you Chewy.com for the pawsome treats! Pals, please see my previous service review about Chewy.com to learn more about this furrific shop! They are very yummy!! I can't think of a dog who wouldn't love them! BOL!! I am going to make Mom look for these next time we go to the holistic pet store. They definitely look like something I NEED to have! Another great review, Pepper. They are yummy!! High Paw! Oh, I love me some beef! Especially Freeze dried beef!! Yummers! I love beef too! BOL!!! You will love these treats! Pepper, I am surprised we even got a photo of the treat you scarfed them up so fast! BOL Great review! BOL!!! You only got to see photos because Mom kept telling me to "leave it--wait". Then she would have the camera button half pressed before she said "ok--take it". BOL!!!! You will love the treats Sugar! High Paw! So, do you have to keep them refrigerated? What keeps them from going bad? Hi Flea! No they don't need to be refrigerated. The freeze dry process keeps them from going bad. The same way astronaut ice cream doesn't go bad. :) I suppose it would be different if it got wet. I'd think it would need to be refrigerated if you re-hydrated it. These sound furrific, Pepper! Thanks fur the heads-up! Yummy! I don't blame you for eating the treats faster than the camera could get a snap! 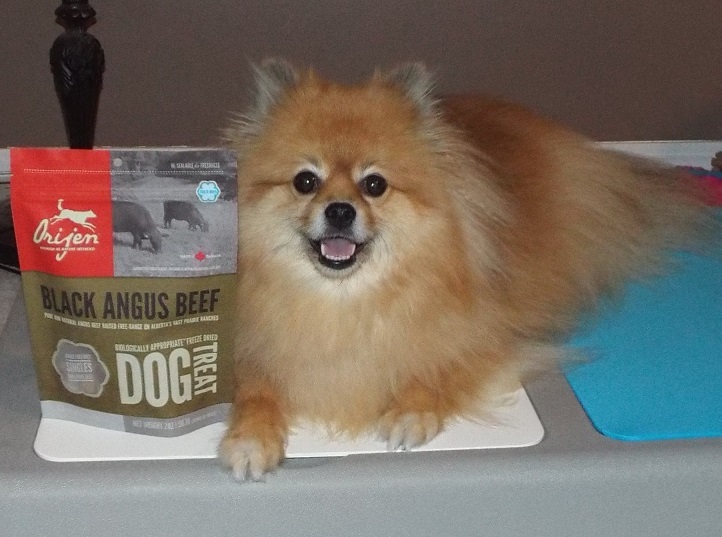 Wow, Pepper looks sooo excited about the treats! Thanks so much for sharing your review and these great photos!